Sailing is a wonderful pastime, but the reality of owning a boat often brings unexpected pressures. Who can I sail with regularly, how much is the upkeep, what happens when my boat is not being used? Generally, if you become part of a boating syndicate you will own part of the asset which means you have direct responsibility for your share of the maintenance costs and upkeep of the boat. You will find privately run and commercial boat syndicates; each will have a slightly different set of rules and regulations, so it’s important to know exactly what you are getting. Perhaps the most common form of boat share currently, private syndicates usually consist of two to five members who each own a part of the vessel and in turn pay for an equal share of the costs involved. It’s rare for new boats to be purchased in this way and private boat share arrangements generally stem from the original owner bring on sharers to spread the cost and responsibility. Despite the often less formal arrangement of a private syndicate it is imperative that an agreement covering every eventuality from, what happens if the boat is damaged to rules for selling your share, is formalised at the outset. To help alleviate the possible downsides of a private boat syndicate you may prefer to join a syndicate that essentially outsources the management of the boat. Typically this could include everything from mooring and insurance to maintenance and cleaning leaving the owners with just the pleasure of sailing. Boat share membership schemes offer you the use of your chosen vessel for blocks of time. This approach offers real flexibility as different prices packages are available depending on when and for how long you have access to the craft. 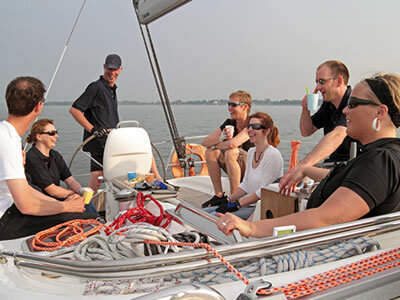 Whilst membership schemes may be a good introduction to sailing, they don’t suit everyone; many people find that the desire to actually own a boat is an important part of the whole experience. To counter this, some of the more innovative membership schemes now offer ownership programmes which offer a lower cost way into boat ownership. Charter purchase is a bit of a hybrid between syndicates and membership and again, there are a number of variations. You can buy a boat outright and then lease it to a charter agent; receiving an income when you are not using it. Alternatively you can pay a percentage of the cost price of the boat up front, usually 50-65 per cent, which gives you the right to use your boat (or a similar one) for several weeks a year, while the company charters her out for the rest of the time. Either way you are essentially sharing your boat with the charter operators’ clients who may, or may not, treat it as their own.